Alexander (356-323 B.C.) 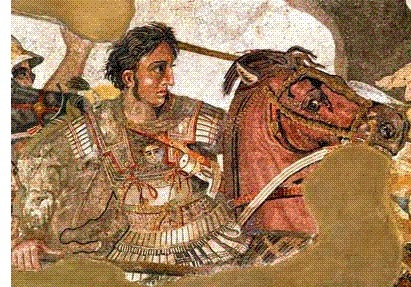 - One of the most famous humans in history and arguably the greatest military commander of all-time, Alexander dramatically altered the course of civilization during his 12-year reign. He threw down one mighty empire, established another and achieved mythical status in his own lifetime. Virtually everything we know of him comes from the writings of four historians, all of whom lived centuries after he did. They are the Anabasis Alexandri (Expedition of Alexander) by Arrian of Nicomedia, Historiae Alexandri Magni (Histories of Alexander the Great) by Quintus Curtius Rufus, Βίοί Παράλληλοι (Parallel Lives) by Plutarch and Bibliotheca Historia (Library of world history) by Diodorus Siculus. They had access to contemporary records now lost, which lends some credibility to their work. Alexander took a historian named Callisthenes with him on his Persian campaign. Initially, he adored the conqueror, but as time passed and Alexander began to adopt some Asian customs, including proskynesis (which was a form of submission bordering on worship), he turned against the king and even went so far as to publicly rebuke him. Alexander was outraged and had Callisthenes executed. This was sometime after the fall of Persia, so much of the expedition must have been well documented before Callisthenes' death. We'll never know how much is true, but what is certain is that Alexander left an indelible impression on history. Because the accounts were written so long after his life, much of it has been shrouded in legend, even from his very birth. The night before his apparent conception, his mother Olympias had a dream that a bolt of lightning struck her womb, signifying that Alexander's father was not Philip, but Zeus himself. Olympias was convinced of her son's divine lineage (or she simply tried convincing others) and was constantly reinforcing in Alexander that he was Zeus' son, not Philip's. In the same year Alexander was born, the Temple of Artemis was destroyed by fire (though not necessarily the same day). The legend later grew that the two events happened on the same night because the goddess Artemis was too busy attending the birth of Alexander to save her temple (see Temple of Artemis). When he was thirteen, a horse trader offered to sell Philip a wild horse for 13 talents. But no one could tame the animal, so Philip refused. However, Alexander noticed that the horse was literally afraid of its own shadow, so he turned him toward the sun so he could not see it. To everyone's amazement, the horse allowed Alexander to mount him. Philip was so impressed that he reportedly said, "Oh my son, seek out a kingdom worthy of your ambition, for Macedonia is too small for you." He named the horse Bucephalas and rode him to the ends of his conquests. Shortly after, he was famously tutored by the great philosopher, Aristotle. After Philip's assassination and the execution of any potential rivals, he carried out the conquest of Persia that his father had planned. In three major battles, Granicus, Issus and Gaugamela (sometimes called Arbela), he finished off the Persian Empire; the greatest the world had seen, and made his even greater (see Alexander conquers Persia below). After Persia, he kept going and pushed to the border of the known world. It was only after his soldiers refused to go any further that he turned around and came back. He died in Babylon at the age of 32 after years of warfare and heavy drinking took its toll on his body.